On February 12, 1951 the Women’s Royal Australian Army Corp (WRAAC) was established to cover a manpower shortage due to the Korean War and national service. Previously women had served in the Australian Women’s Army Service (AWAS) during WWII from August 1941 until June 1947.The introduction of WRAAC into the Citizen Military Forces (CMF) was approved in December 1951 with recruiting beginning in June 1953. Training was based on the same syllabus as the Australian Regular Army (ARA) and the uniform worn was also the same as the ARA. The Southern Command (Victorian) CMF unit was raised as 8 WRAAC Coy until 1960 and then became 3 WRAAC Coy as a result of an army re-organization. In the mid 1970’s the name of the CMF was changed to Army Reserve (ARES). The WRAAC CMF/ARES was disbanded in 1976 and all members were recruited and enlisted in male units. The WRAAC Regular Army were disbanded in 1984. 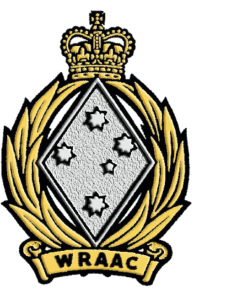 The ‘WRAAC Reserve Association (Victoria)’ was founded in August 1976 with the desire to promote social functions for former members of 8/3 WRAAC Coy. In November 2007 the name ‘WRAAC Reserve Association (Victoria)’ was changed to ‘WRAAC Association (Victoria) Inc.’ thus allowing women who have, or are serving in the Australian Military Forces, to join the association and participate and enjoy the social events, ceremonies and comradeship that the Association offers. This is not an official military website. All information in this website has been obtained from past members and associates of the Women's Royal Australian Army Corps. If you consider that any information is inaccurate or incomplete do not hesitate in contacting us.